And because kids are still growing, they’re more sensitive to radiation. This is why, at Main Beach Dental, we often hear parents or guardians ask if X-rays are safe for their children. We answer that no patient should be exposed to more radiation than needed, regardless of age, but in some cases an X-ray is just what is called for. Let’s take a look at what X-rays are, their pros and cons, and how we use X-rays at Main Beach Dental. X-rays, an invisible form of electromagnetic energy, form images on exposed film after they pass through the body. Because X-rays take more time to pass through dense tissue like bones and teeth, those areas appear lighter on the film than less dense tissue like the gums. This makes it easy to detect issues like decay or cracks because the damaged tooth structure has a different density from what surrounds it, and thus appears in contrast against healthier tooth structure. And they all include different, but small, doses of radiation. What is the radiation level of X-rays? Dental x-rays are one of the lowest radiation doses that scientists study. A routine exam with four bitewings is about 0.005 micro-Sieverts. To put that number in context, it is equivalent to less than one day of the normal background radiation we receive from nature. It is also equivalent to the radiation we receive during a short aeroplane flight (1 to 2 hrs). To put it another way, most of us receive 3,000 and 4,000 micro-Sieverts of radiation each year. So, the amount of radiation exposure dental X-rays is relatively minor, particularly when compared with radiation you receive from natural sources. Children are smaller than adults, so their organs are closer to the location of the X-ray. Children are more sensitive to radiation exposure than adults. The younger a child is when they have an X-ray, the longer the amount of time there is for radiation exposure to lead to cancer. X-ray machines often have exposure settings designed for adults, not children. This means the amount of radiation used can be excessive for smaller children. In a moment, we’ll take a look at how Main Beach Dental gets around these issues. The benefits from obtaining X-rays, which include identifying decay, injury, or abnormality, normally outweigh the risks of being exposed to the small dose of radiation in a digital X-ray. Your child’s safety can be bolstered by making sure they wear a lead apron with a lead thyroid collar to minimise any potential impact. Often, an X-ray is necessary to help your Main Beach Dental dentist diagnose potential issues that cannot be uncovered through a visual examination. This means we only want to expose a patient to the lowest and safest levels of x-ray dosage and frequency that will achieve the most benefit. 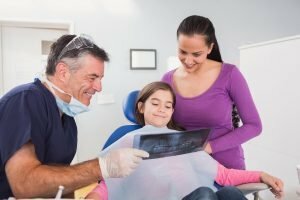 Consequently, we don’t give children X-rays unless they need them, and if dental issues can be diagnosed using other techniques, we will use them. Beyond that, digital advances in X-ray imaging have dramatically reduced the amount of radiation energy needed to achieve the same results that film once gave us. Today’s digital X-rays have other advantages as well. Because they are digital, they can be viewed much more clearly and in larger formats, they can be accessed easily, all of which makes diagnosis and treatment easier. But the best part of digital X-rays is that they do not expose children to high levels of radiation, while allowing dental problems to be identified and treated early. These lower exposure levels and the ALARA standard helps ensure your child’s exposure to x-rays will be well within safe limits. At Main Beach Dental your dental health is our number one priority. We are composed of highly trained registered dentists with impressive clinical skills who work together to provide you comprehensive dental services. We provide gentle, skilled care for all dental conditions and work with you to prevent disease, decay, and too many dental appointments in the future. Our commitment to our patients is dental health for a lifetime! Call us on (07) 5503 1177 or visit us at 11/26-30 Tedder Ave. in Main Beach.